Recently we got too much questions about this problem. We decided to provide more information on how to use / enter Omegle video on iPad devices. You will find a good information on here. Feel free to ask us if you have any questions regarding this issue on this page. You can ask us through Q&A or commenting this page. 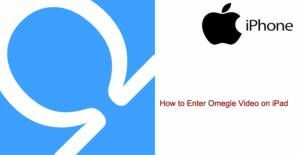 If you would like to know how to do that on iPhone devices, you can click here: Omegle Video For iPhone and Alternatives. You will find more information for iPhone devices on this page. Let’s begin to tell you how you can enter the video chat through using your iPad. We recommend you to try also alternatives, you can find many good stranger applications on here: Omegle Alternatives for iPad. Omegle has officially claimed that Omegle is working with Chrome Beta a few years ago. However Chrome Beta is not supporting Omegle now. We have tested many other browser application on our iPad devices but there weren’t any good solution for entering the video chat except one… We recommend you to use Puffin browser for entering to the Omegle. The usage of the application is a little bit complicated but we should remind you that you will need to use full view version instead of mobile view of the plugin. You can change that from the settings of the app. This will help you to fix things on your device. You can click here to download Puffin Browser from App Store. Puffin browser is not just good for Omegle. The browser will also let you play many flash games on your iPad device. However sometimes the application can be banned because of some reasons. It is because the browser is using a proxy service and when someone get bans with that IP, whole Puffin users can be banned. You can find a detailed information on the link below. If you need more help about Puffin browser or usage of Omegle on iPad, please ask us. You can also use Emerald Chat and many other video chat sites with this application. See Also: Why Puffin Browser Banned on Omegle? Wow. I can even play game of thrones browser game with puffin. Amazing! Hello, I was using puffin browser for join Omegle with my tablet. Now, it says I am banned! Why? Too many people are sharing the IP with you. If they ever get ban, you will be banned with Puffin too. You are using a foreign IP with Puffin browser.